Well, it has been nearly a year since my last post in this series. Don’t worry, that isn’t reflective of the amount of time this process takes! In order to put this pattern into repeat and to insert a ground color, I needed all of the motifs to be isolated—that is, removed from the paper ground. Although it sounds easy enough, it’s actually quite a tedious task unless you’re willing to settle for rougher edges or to limit yourself to ground colors that are similar to the original; ground colors that are comparable to the original substrate don’t require the isolation to be done as neatly, simply because the edges are difficult to see due to lack of contrast. I want to preface this post by saying the method shown below is a quite outdated, perhaps unnecessarily so. In fact, it is not even the way that I typically go about it. However, I had so much going on in this design and had invested so much into its line quality, I just felt the need to continue doing as much of it by hand as I could. Additionally, it may have actually been faster doing it this way—it’s hard to say without a direct comparison. Essentially, either way you approach it—by hand or on the computer—you are drawing an outline. There was so much to outline in this design, and I am simply better at drawing by hand, so in this particular case I opted to go low-tech. Taking this approach, there isn’t much to explain at this step—I simply traced the outlines of the entire design. The concept to keep in mind as you work is that your line will be part of the ground, so you want to keep it on the outside of the painted elements without leaving any white space between the painting and your traced line. A detail showing the traced area lifted away from the original painting. I definitely advise taping your paper down and not removing it until you’ve tackled the whole thing. Lining up the outline with the painting will be hard enough without having to deal with inaccuracies that could have been avoided. The completed outline tracing, taped down to the original painting. My scanner at home was much too small for this activity, so I used a larger scanner at the facilities of a school. However, it was still too small to fit the entire artwork in one go, so I had to align and merge the separate scans together on Photoshop. This causes a whole set of extra headaches, and I would advise against it if you have the ability. If you do have to do it this way, continuously check how the outline is lining up with the painting by putting it on top as a transparent layer. The completed outline tracing, in the process of being merged on Photoshop after having been scanned into the computer in pieces. Once you have the entire outline merged into one image, you can easily use Photoshop to limit it to exactly two colors using the Indexed color mode. 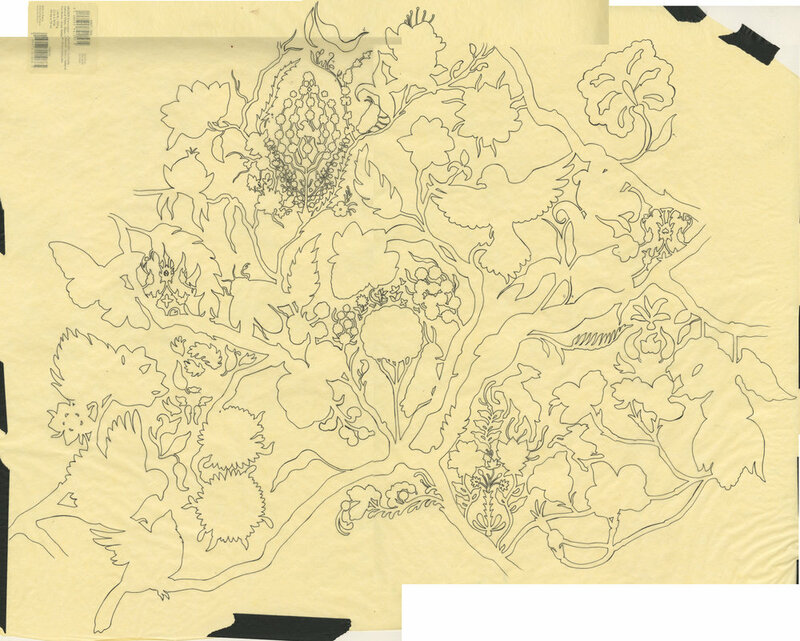 The scan of the outline tracing edited on Photoshop to only contain two colors: black and white. Overall, this should give you clean lines to work with, but you may have to do some touch ups. From this point, it becomes easy to use the paint bucket tool to fill in all of the areas that are supposed to be the ground, or negative space. The silhouette of the design showing where the painting will be selected (in white) and the ground (in blue). Here, the outline has been merged into the blue ground. As you can see, you now have your silhouette that delineates the painted areas versus the ground area. Layer this over the scan of the painting (which we’ve ensured is perfectly aligned), select the ground area, and delete it from the painting layer. Voilà! You have a floating design with all evidence of the substrate erased. Once you have this image separated from a ground, it becomes much easier to manipulate. All ready to be put into repeat! The design put into repeat, shown on another ground color. Now that the design is isolated, it only takes a second to change the ground color. Changing the background color is so easy once you’ve reached this stage that playing around with it is irresistible. You can take a look at some of the colorways I arrived at here—as you can see, thus far this design is not in limited color, so it is only the ground color that is changing in these versions. Limiting the color is definitely possible through Photoshop’s indexing mode, which I have begun. However, it is quite a delicate process on such a complex image, full of blended colors. In order to get it down to a workable number of colors, a level of detail and painterly quality will inevitably be lost. The benefit, of course, is that the colors can then be easily changed, allowing for unlimited variations and edits. Finally, this little series of posts on creating a hand painted repeating design is complete. The design didn’t turn out exactly how I had originally envisioned (it rarely does), but I am very satisfied with it nonetheless…it’s always rewarding when you have full creative control from start to finish! I hope that you’ve learned a bit about what is involved in this process and, if you’re so inclined, feel inspired to go on a similar journey. Start this series from the beginning here.